Designed for customers with higher production demands, the Duplo DSF-5000 Sheet Feeder offers a high stacking capacity of 24″ for maximum productivity and an increased flexibility with paper sizes. Connectable only with the high-end DBM-500 Pro Bookletmaker, the DSF-5000 can process pre-collated digital or offset documents from multiple printers up to 400 sheets per minute. Duplo’s proven belt suction feed system combined with its paper separation system provides consistent, dependable feeding. Its dual double feed detection system with optical and ultrasonic sensors ensures each sheet is fed with accuracy while the anti-static device further improves reliability. 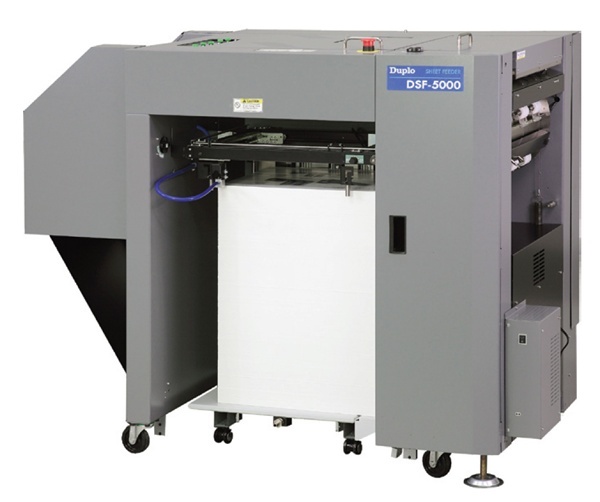 The DSF-5000’s modular design allows it to also be configured with the SCC unit for in-line slitting, cutting, and creasing or the DKT-200 Two-Knife Trimmer for applications requiring a full-bleed finish – creating a powerful bookletmaking system. PANGEA/COPYPAGE, located in Los Angeles, CA, is creating variable data booklets, such as health insurance policies, personalized coupons and newsletters, using a complete bookletmaking system from Duplo. Previously combining manual methods with a unit from another manufacturer, the company installed the 500Pro Digital Booklet System, which configures a DSF-5000 Sheet Feeder with the DBM-500 Bookletmaker, and a square spine module to increase the productivity of their operation. The DSF-5000 processes pre-collated sets at up to 400 sheets per minute into the DBM-500, where it is then accumulated, stitched, folded and face trimmed into high-quality booklets. The booklets are then processed and finished by the square spine unit. “The system has increased our speed and accuracy, and provides the ability to process pre-collated sets offline, which is something we could not do before and is required in a digital environment,” says Lundy Smith, president of Pangea. “It also provides the ability to do variable booklets, which is needed for a VDP business like ours. The intelligent stitching capability ensures accuracy of the finished product.” Pangea is a digital print service and web-enabled document procurement provider serving the Los Angeles area.